Traffic and related impacts are one of the biggest problem for all cities, in all parts of the world: Air pollution, reduction of public space, accidents, congestions, cars “taking over”, we can see these developments in cities of all sizes. GHG emissions from the transport sector grow, and even the most ambitious cities – they often grow in population – realize their transport related emissions bring them away from carbon neutrality goals. 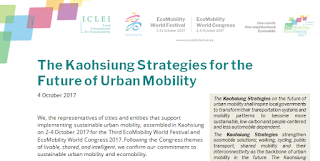 The Kaohsiung Strategies are based on the Shared Mobility Principles for Livable Cities, launched by 13 organizations in Kaohsiung in October 2017. 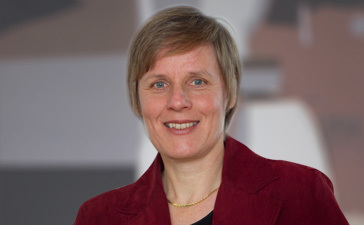 (https://www.sharedmobilityprinciples.org/). They explain what these principles shall mean in practice for local decision-makers and experts. Capacity-building (17.9): “Educate local government staff so they may engage in and facilitate debates”. The Kaohsiung Strategies also want to provoke debate (e.g. : “Plan for a maximum of 150 cars per 1000 inhabitants, mainly as shared cars”) and call local governments and their partners to urgently engage in the debate on autonomous vehicles (e.g. “Regulate the operation of autonomous vehicles with public interests and infrastructure in mind” and “Require that all autonomous vehicles are zero-emission and part of shared fleets”). The Strategies also bring new challenges on the agenda (e.g. : “Acknowledge the rights of street vendors, given they respect the sharing of public space and transport their goods in non-motorized or small and emission-free vehicles” and “Protect the urban airspace in our cities & Limit the operation of drones and flying automobiles and taxis in urban areas to public security and public interest purposes and require permitting processes in participatory, transparent procedures”). 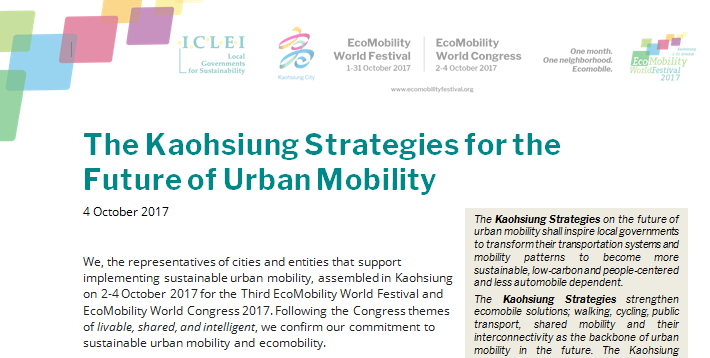 The document is available in various languages, as are the Shared Mobility Principles in text and poster. Help us to bring this to the attention of decision-makers, experts and NGOs.